Although construction has been underway for some time, new renderings have surfaced for Shimoda Design Group's Macy's-topping tower in Downtown Brooklyn. The structure, a 14-story office tower, is slated to rise inside and on top of the three buildings occupied by the department store on Fulton Street. The strip, one of the busiest retail corridors in the city, has been targeted in recent years by investors due to its proximity to prime Brooklyn neighborhoods like Fort Greene, Boreum Hill, and Brooklyn Heights. 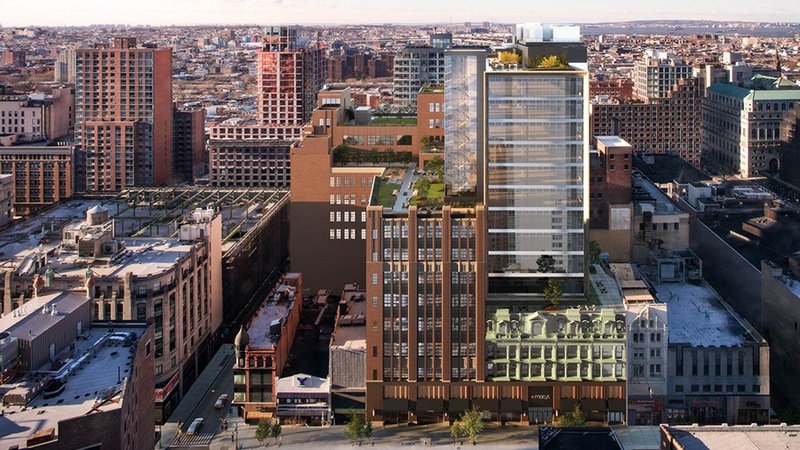 Developer Tishman Speyer is calling this 256-foot-tall project the Wheeler. It will bring almost 844,000 square feet of office space to the area, with floorplates in the new building ranging in size from 34,000 square feet to 60,000 square feet. Macy's is staying on as a retail tenant in the bottom four floors, while offices will occupy the other ten stories. Because the four lower floors are an amalgam of different buildings, these volumes will feature 90,000-square-foot floor plates and 16-foot-tall ceilings. The new structure sports a glass curtain wall with angled fenestrations, and outside, the setbacks and the roof will be crowned with 11 terraces, YIMBY reported. Perkins Eastman as the architect of record. If all goes according to plan, the Commercial Observer noted the project is expected to be complete by the middle of next year. 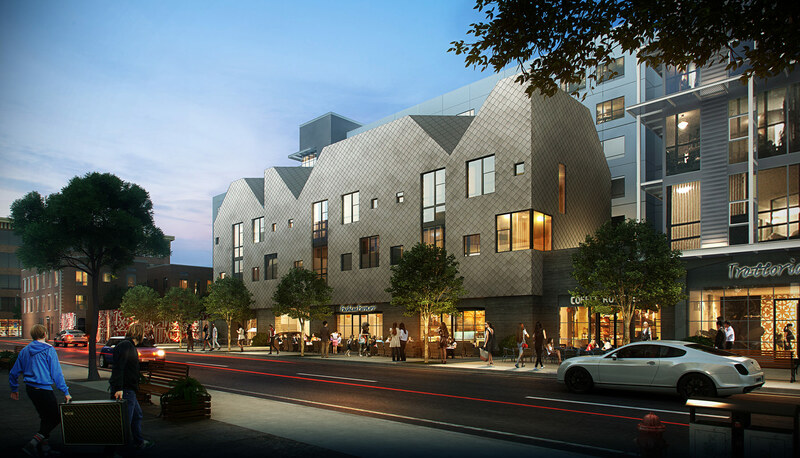 A common refrain resulting from the Los Angeles Arts District’s ongoing gentrification goes like this: “There are no more artists left in the Arts District.” To stem the loss, Steinberg has imbued the AMP Lofts development, a 320-unit live-work complex that will cater to this shrinking demographic, with artist-friendly amenities and contextual formalism. The 390,850-square-foot project, developed by Greystar and designed in concert with Shimoda Design Group, features a “clubhouse”—a space designed specifically for residents to fabricate and showcase large-scale artworks. The double-height loading dock and production facility protrudes from the parking podium as a separate volume, joining storefronts, an entry lobby, a set of townhouses, and a series of paseos as the project’s public faces. Simon Ha, principal at Steinberg, said that the firm intended to “design simple buildings that would blend in with the existing industrial Arts District neighborhood.” The project, after all, is named for the AMP Automotive complex that formerly occupied the site. Ha explained that the design team sought to make the street fronts “funkier than those of a typical podium-style building” by designing the complex as a series of “jewel boxes elevated above parking.” The result is a cluster of layered mid-rise structures: stacked flats wrapped in vertical and horizontal louvers, gabled townhouses clad in lapped metal shingles, and a clubhouse wrapped by a large factory-style clerestory window. 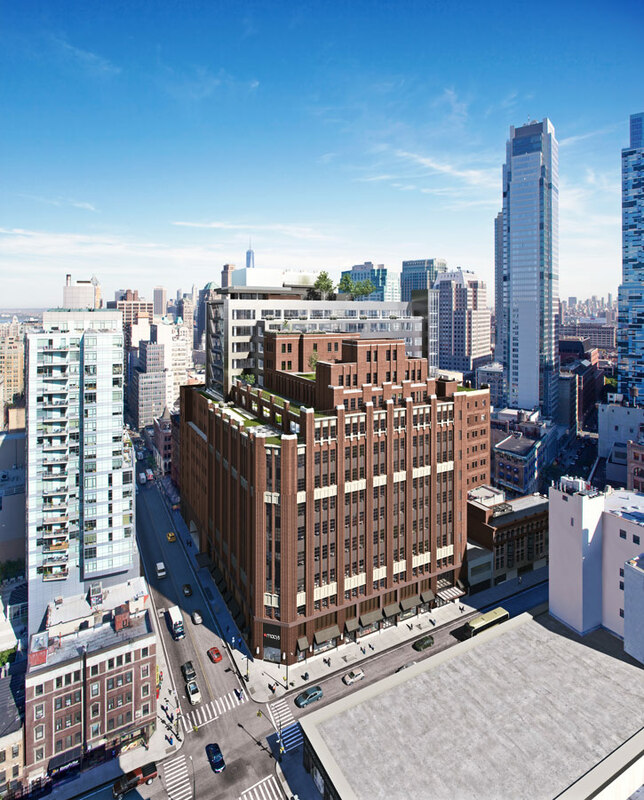 The founder of Los Angeles–based Shimoda Design Group, Joey Shimoda, is collaborating with New York's Perkins Eastman to design the project, which will add 620,000 square feet 0f Class-A office space to the neighborhood. In a nod to Brooklyn history, the developers are calling is project The Wheeler after Arthur Wheeler, the guy who built the Macy's that grounds the new building. The department store will continue to own the first four floors for use as retail, plus the lower level of the two connected buildings. Meanwhile, The Wheeler will have its main entrance on Livingston Street between Hoyt Street and Gallatin Place. 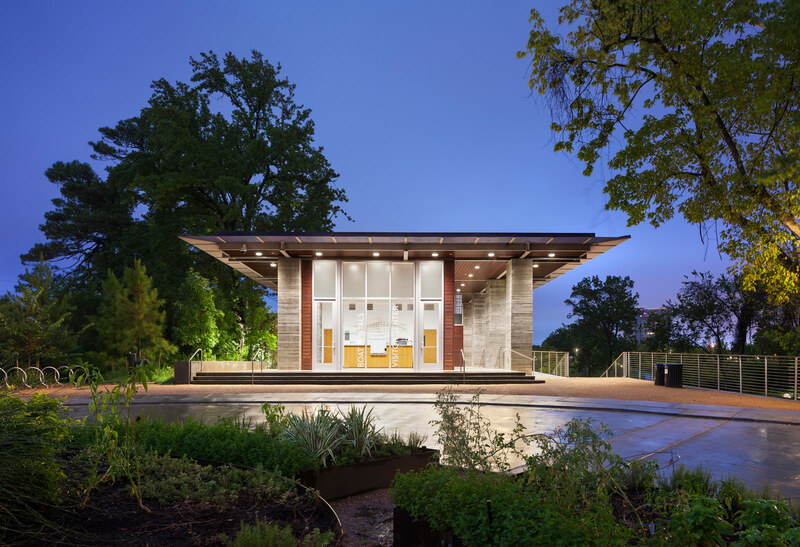 As part of a varied program of structures commissioned for Houston’s three-mile long Buffalo Bayou Park, Page’s pavilion is designed to withstand the area’s frequent flooding. Solid board-formed concrete piers provide resistance to flood damage and are paired with an expressive steel frame and delicate steel screens to create shade. When a severe flooding event occurred just after completion of the structures, no damage was sustained. To provide a home for the world’s largest LGBTQ Jewish community, ARO renovated a landmark Cass Gilbert–designed warehouse to create a synagogue that embodies the community’s core values of transparency, intimacy, warmth, and flexibility. The renovated 8,400-square-foot building and public pedestrian space infuses a new sense of cultural and pedestrian connectivity in downtown Glendale. Shimoda Design Group kept the interior of the gallery space as raw as possible, while maximizing its existing volumes to include a neon workshop, classroom, and museum shop. The Playa Vista neighborhood on Los Angeles’s west side is quickly becoming Southern California’s answer to Silicon Valley, as it plays host to a growing contingent of technology-focused companies like Google, Facebook, Yahoo, YouTube, and WeWork. And as capital, brainpower, and new residents flow into the area, so too have big-name architecture firms with high-minded designs. The Playa Vista tract was originally owned by airline mogul Howard Hughes, who used the ocean-adjacent expanse as the manufacturing facility and airstrip where he built his famous Hercules (Spruce Goose) airplane. President Bill Clinton designated the 1.3-square-mile area as one of six national pilot projects of the Partnership for Advancing Technology in Housing in 1998, and the property began its redevelopment as a mixed-use neighborhood in 2002. In the years since, the 460-acre area, partially master-planned by Los Angeles–based Moule & Polyzoides, has seen its population boom to over 10,000 residents. In recent years, the area has gained the moniker “Silicon Beach,” as technology companies originally based in the nearby communities of Venice and Santa Monica have outgrown their initial outposts, expanding the technology industry’s footprint southward. Last year, Google signed on to lease 319,000 square feet of space in the Hercules Campus, a complex redeveloped by Brenda Levin and Associates and EPT Design for the Ratkovich Company, including the 200- by 700-foot Hercules building in which Spruce Goose was designed. The team restored the building, adding pedestrian-oriented amenities to the complex while also converting the historic structure into a series of soundstages and tech-friendly offices. Michael Maltzan Architecture, which designed the eight-acre Playa Vista Central Park in 2010 with Office of James Burnett (OJB), is adding a new 425,300 square foot office complex called The Brickyard. The Brickyard is also beind developed with OJB. The new complex, currently under construction, will feature partially-sunken landscaped parking areas that aim to extend the park outward into the office zones. The office structures, articulated as a maze of stacked, shifted, and offset volumes, are made up of two principal masses: one long office block that bends at two elbows in order to frame the aforementioned parking deck and a singular, six-story office tower. Both buildings feature punched openings as well as a variety of delicately-articulated access points that connect the parking and ground-level areas with what’s above. The complex will include a 9,000-square-foot daycare facility and will help fulfill Playa Vista’s goal of becoming a full-service neighborhood. Gensler has also been busy at Playa Vista, undertaking the architectural repositioning of four existing office spaces in its Playa Jefferson complex. Vantage Property Investors has announced a tech-focused project dubbed “Building E,” which will encompass another large office structure designed for creative collaboration. The structure, undertaken with 360 Construction Group and AHBE Landscape Architects, will bring 200,000 square feet of open plan creative office space to the district, with large expanses of glass, terraced floor plates, and a cantilevered anchor office space. Li Wen, design director and principal at Gensler, detailed several key aspects of the design, including “side-core configurations that allow open floorplates, direct access to and abundance of private outdoor space, operable windows, sawtooth skylights, thinner floorplates for natural ventilation and deep penetration of natural light, and flat slab construction that provides for 13-foot ceiling heights.” The ocean-oriented project is located adjacent to the “lifestyle amenity-rich” Runway at Playa Vista Apartments by Johnson Fain. Last but not least, Shimoda Design Group and OJB completed work in 2015 on The Collective, a 200,150-square-foot, LEED Gold office park complex designed for Tishman Speyer that features five two-story buildings clad in distinctive, tilt-up concrete panels (seen at the top of the article). These panels, interspersed with expanses of glass, are topped by zigzagging, metal-clad roofs. 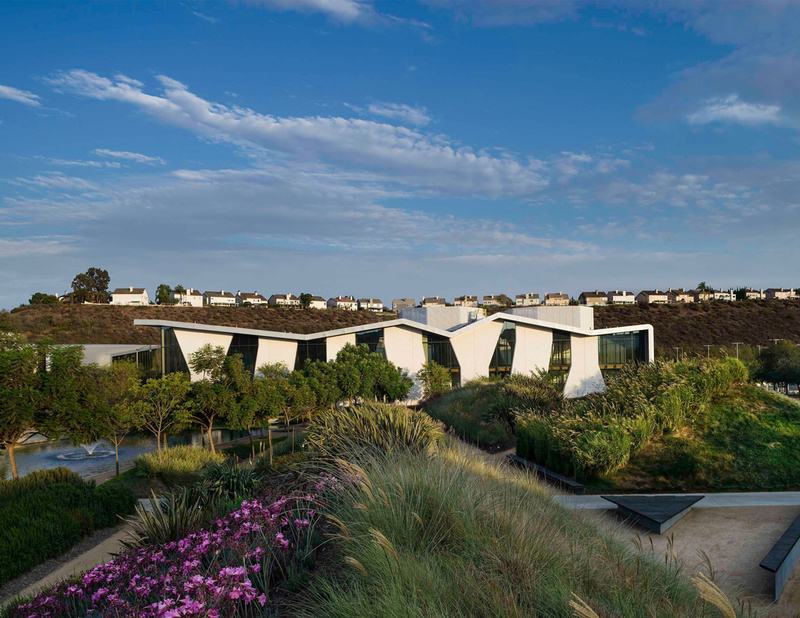 The campus connects the humdrum of office life directly to the adjacent outdoor areas via a series of landscaped paths, bringing in the sensitive Ballona and Bluff Creek wetlands that run alongside Playa Vista’s northern and southern edges. With new lease agreements being signed almost by the day and the careful, meticulous process of filling in the district’s vacant parcels fully underway, Playa Vista looks more and more like a sure bet for L.A.’s growing roster of creative offices spaces. Five years after closing its Downtown L.A. location, the Museum of Neon Art (MONA) has reopened in a new space between the Americana at Brand and a public library branch in Downtown Glendale. The country’s only museum dedicated to neon, MONA will feature works by contemporary artists in rotating exhibitions as well as a permanent collection of the kinds of signifier-icons that distinguish Los Angeles’s vernacular architecture. Included, for instance, is the famous Brown Derby sign that was once a Hollywood beacon. An 8,400 square foot renovation is joined by a new public space and, fittingly, neon-adorned signage that draws from the museum’s collection. 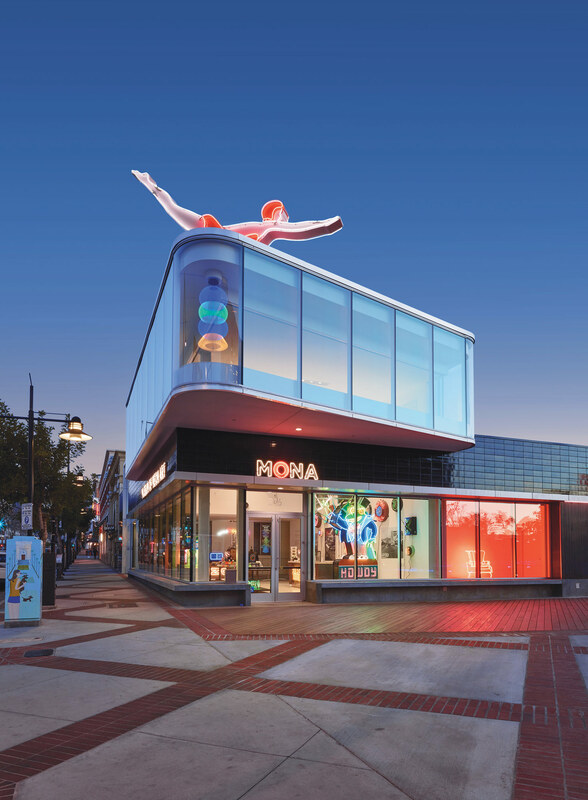 Sited on one of Glendale’s broad and highly trafficked boulevards, South Brand, MONA’s new facade embeds the museum in its cultural-commercial context, which includes landmarks such as the Alex Theatre’s famous marquee and more quotidian neighbors like BevMo. A partnership between the Glendale Redevelopment Agency, the Department of City Planning, and Shimoda Design Group (SDG) generated the programmatic focus on public space and public programs. Using the powerful draw of the Americana complex, the designers and museum board hope to pull visitors from the mixed-use mall to the west, and, using the covered passage that bisects MONA and the generous open space around it, knit the Americana, the Glendale Central Library and Park, and the Museum together into one symbiotic, activated Downtown whole. Shimoda’s adaptation of two existing buildings—a Rite Aid and a video arcade—reflects a thoughtful opportunism. The project was treated as “a surgical incision.” Since the structure and shell are largely preserved, the exuberance of the museum’s collection is allowed to play off of the patina of the buildings’ history. “It was important to use an existing building because the signs really thrive in a space that looks older,” Joey Shimoda, Principal of SDG, explained. Exposed ductwork and a restrained palette—brick, honed concrete, and white and black paint—further draw the art into focus. The project’s major architectural moves create or interact with public space: a double height lobby and broad, glazed entry face the street. Along with the neon inside, this creates “a lantern for the community.” The public paseo, created through strategic demolition, bisects the site and draws visitors across a landscaped deck to the park and library behind. The museum, originally founded in 1981 by Lili Lakich and Richard Jenkins, has been guided by a celebration of Southern California’s built heritage—including the signs that have adorned its drugstore, diner, and gas station facades—and a respect for the craft of “neon bending.” Workshops will be held in MONA’s street-fronting neon bending studio and visitors will be encouraged to experience Los Angeles’ neon in its proper context: nightly bus tours will highlight the newly renovated Clifton’s Cafeteria and other historic Downtown L.A. landmarks.